As you know fraud from cash machines is becoming an increasing problem around the UK and recently gangs of criminals have been targeting the cash machines on London Underground premises. The pictures below were taken at Hammersmith station in the past week. The first picture details how the Barclays cash machine normally looks. 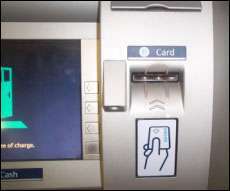 The criminals have been fitting portable card readers to the machines which clone the card details. 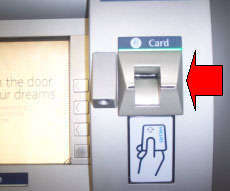 The second picture details how the cash machine looks after the cloning device has been fitted with double sided tape. Please be aware of this scam which may also be used on other machines around the country. If you become aware that a device has been fitted to a cash machine, please bring it to the attention of any staff where the machine is located and/or contact the local police immediately.